Cryotherapy or “freezing” is a treatment technique in which skin lesions are frozen. 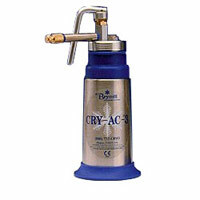 Cryotherapy can therefore be seen as a controlled way to induce localised frost bite. The freezing of the skin lesions is achieved by spraying a cold liquid in aerosol form onto the skin lesion. The liquid is most often liquid nitrogen which has a temperature of -196 degress Celcius. Many different skin lesions, including Warts, Solar keratosis, Seborrheic keratosis and Molluscum Contagiosum can be treated with Cryotherapy. The treatment is uncomfortable and can sometimes be painful. For this reason alternative therapies should at least be considered in children. Warts and Molluscum Contagiosum in children are often easier and less painfully treated with wart immunotherapy or Cantharidine application respectively. There are also better treatment options for solar keratosis and severe sundamage, especially photodynamic therapy. Despite newer and sometimes better alternatives to cryotherapy, cryotherapy still has a role to play in some skin conditions. Does this treatment eradicate penial warts of about 10years old. Cryotherapy can treat penial warts. It may have to be repeated multiple times. My daughter has corns (calluses) on her feet which is quite painful and won’t go away, will this treatment work for this. What will it cost and does your medical aid cover for this. Dear Desiree. Yes, it will help, but if it is corns, then ultimately addressing the cause of excessive friction is the best treatment. Cost depends on the number of calluses……ballpark R600-R1200 per session. Medical aid normally does cover cryotherapy, but best to check with them. There are various treatment options available and priced accordingly. It would be best to see the Dermatologist for assessment and treatment.